When Mark Taylor AO retired from international cricket, the curtain fell on an outstanding career as a player and Test captain. In a stunning farewell tribute, the influential international cricket bible Wisden saluted Mark Anthony Taylor as ‘the greatest modern day captain’. During the decade the 1999 Australian of the Year opened the batting for his country and the five years he was its highly-acclaimed and successful captain, the New South Welshman, voted Australia’s most admired sportsperson by Inside Sport magazine in the year of his retirement, was in the vanguard of a triumphant era for Australian cricket, departing the game with his country clearly the No. 1 Test-playing nation. During the Taylor regime, the record books were constantly updated on both a team and personal front. Taylor, himself, left the game with several proud personal milestones. Among them was his then record-equaling 334 not out in the second Test against Pakistan at Peshawar in October, 1998. His history-making, 12-hour innings, compiled from 564 balls and laced with 32 fours and one six, enabled him to then share the mantle as Australia’s highest run scorer in Test cricket with the incomparable Sir Donald Bradman, who scored his 334 against England at Leeds 68 years earlier. Taylor played 104 Tests for Australia, 50 as captain, scoring 7,525 runs at 43.50. An outstanding slips fieldsman, he took 157 catches, holding the world record until Mark Waugh passed his mark. Mark Taylor in 2003 was appointed an Officer in the General Division of the Order of Australia (AO)for his outstanding contribution to cricket and support of organisations involved in fundraising for cancer research. In 2003 he was also inducted into Sport Australia’s Hall of Fame as well as receiving a Centenary Medal for his services to the community and cricket. In 2011, Taylor was inducted in the Australian Cricket hall of Fame, joining such luminaries as Sir Donald Bradman, Victor Trumper, Bill O’Reilly, Keith Miller, Arthur Morris, brothers Ian and Greg Chappell, Richie Benaud and Dennis Lillee. Mark Taylor serves as a board member of Cricket NSW and Cricket Australia. 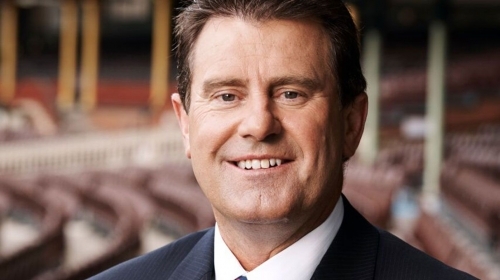 A member of the Nine Network’s cricket commentary team, Taylor is considered one of Australia’s most inspirational corporate speakers. To mark his playing days with Northern Districts in Sydney, Mark Taylor in 2011 had the honour of having the club’s home ground, Waitara Oval, renamed Mark Taylor Oval.